So today Beach Buggy Blitz passed 10 Million downloads in the Google Play app store. I come from a console development background. Back when I worked on console games for the PS2 and Xbox, and Xbox 360, we had a completely different idea of "audience". The most successful console game I ever worked on was when I was at Stormfront Studios: Lord of the Rings: The Two Towers. I believe that game sold something like 4 million copies across all platforms, and that was considered a huge success. Heck, it WAS a huge success! Of course LOTR:TT sold for $50/copy or something like that so we're talking about a lot of money. Beach Buggy Blitz is free, and we depend on lots and lots of people playing the game in the hopes that a few of those people will pay. And in fact about 1.5% of players do eventually buy something. So for us, a small company, Beach Buggy Blitz is also a huge success. But apart from the money, the thing that amazes me is the idea that 10 million people have played our game. And most of them really liked it! We know it's not perfect, there are lots of things we'd love to improve or do differently if we had to do it over again. But still, we poured a lot of our creativity and hard work into that game, and to think that 10 million people have played it and mostly enjoyed it is really staggering, and a little humbling. I wonder how many total hours of gameplay that is... [Eyes glaze over]. 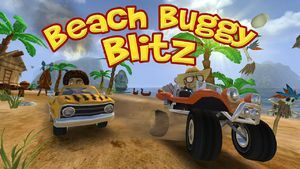 Anyway, to all of you who have played Beach Buggy Blitz, thanks a lot for your support and your engagement, and for the ideas that you have posted on our Facebook page or tweeted or emailed to us. And thanks even for some of the criticisms which have helped us make the game better. The Beach Buggy Blitz story is not over! There will be more updates and fixes and patches. And most importantly we have big Beach Buggy plans for later this year. Hopefully we'll continue to do justice to the parts of the game you like, and add even more stuff for you to enjoy -- I'd hate to have 10 million people angry at me! The new winter expansion update for Beach Buggy Blitz is now available for download on the Google Play Store. This is a major update to the game, a ton of new content and gameplay options! In addition, we've added a new 5th upgrade level for all Powerups in the game. There's a new +2 second upgrade for the Checkpoint, an even faster Boost, and more! You'll also find the "Tune Up" Gadget in the menu alongside the Drop Ship and the Extra Life. It gives your car extra performance for the next race, perfect for a run at the leaderboards! And -- as if all that wasn't enough -- you also get new achievements! Happy holidays, everyone, hope you enjoy playing the update as much as we've had making it! The Winter Expansion pack IS going to make it to iOS as well. We need to do some further optimization, and of course as always wait a little while after we submit the udpate for Apple Approval. We expect it to be available in mid-January 2013. GameFanatics has designated Riptide GP one of their "Top Honeycomb Apps for Android Gamers". This game is incredible, down to the most minute water droplet, and with great gameplay and easy controls Riptide GP earns nothing but praise from me. You’d expect a game with such great graphics and intricate physics to have a few hiccups but I had nothing but a buttery smooth experience. If you own an Android tablet, you’d be doing yourself a disservice by not downloading Riptide GP. You can check out the full article with all their recommendations by clicking on this magical hyperlink. Video game mega-chain Gamestop has started selling Android tablets in a select group of stores around the country this holiday season. The tablets come pre-installed with a hand-picked selection of games, and guess who's on the list? Riptide GP will be preinstalled on thousands of Gamestop tablets and playable in demo stations at over 200 stores around the country (including Powell St in San Francisco). We're in pretty elite company, too: the other games in the lineup are Dead Space, Monster Madness, Sonic CD, and Re-Load. That's a pretty package of gaming goodness right there. The other thing Gamestop is rolling out that we're pretty excited about is a bluetooth gamepad, for $39. One of the great things about Android is you can easily connect a gamepad via Bluetooth or USB; prop your tablet up on the table or connect it via HDMI to your TV, and you've got yourself a game console that travels. The problem's been that decent Bluetooth gamepads are hard to find -- hopefully the Gamestop intiative will change all that, and encourage more developers to add gamepad support to their games! More info on the Gamestop deal can be found here, in this article on Inquisitir.